Blue Sky offers a Hire and Fly service to all Helicopter pilots subject to a quick check ride with one of our instructors. This is to orientate the pilot with local airspace procedures and land landmarks (a request from local ATC) and to assess the pilots flying ability (a requrement for insurance purposes). With 10hours on Type. Terms and conditions apply. 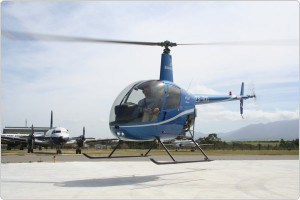 You will be required to do a dual check before you may hire and fly any of our helicopters. This is for insurance purposes and for your account. Please bring along your pilot logbook and your pilot licence. You will be required to sign our hire & file contract. We can send it to you if you would like to read through it before hand. You will be required to pay a deposit of the hours you are intended to fly.